People with pacemakers or defibrillators who experience short episodes an abnormal heart rhythm called atrial fibrillation have no higher risk for stroke or other medical complications than people without documented atrial fibrillation. This suggests immediate use of anticoagulant drugs may not reduce stroke risk for those with only short bouts of atrial fibrillation. Dallas : People with pacemakers or defibrillators who experience only short episodes of an abnormal heart rhythm known as atrial fibrillation have a very low risk of stroke, suggesting that anticoagulants in this group of patients were not likely to reduce the risk for stroke, according to new research in the American Heart Association’s journal Circulation. Atrial fibrillation is the most common abnormal heart rhythm, affecting approximately 2.7 million Americans. Previous research demonstrates that people with prolonged episodes of atrial fibrillation are at an increased risk for cardiovascular complications, including stroke. As a result, guidelines recommend that patients with atrial fibrillation take anticoagulants, blood thinners that decrease the ability of the blood to clot, to reduce their stroke risk. However, it has been unclear whether “short” episodes (estimated as less than 20 seconds) also increase medical risks and warrant anticoagulants. Researchers analyzed 37,000 individual ECGs from 5,379 patients over 2 years enrolled in the RATE Registry, an ongoing study following patients with pacemakers or defibrillators that constantly monitor their heart rhythm. 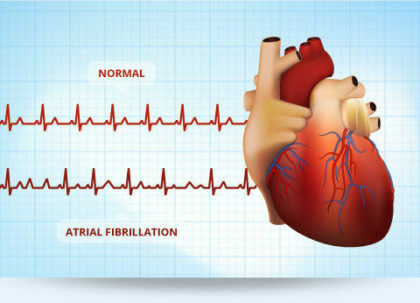 The study confirmed that long episodes of atrial fibrillation are associated with increased risk of stroke, heart failure, ER visit or hospitalization for an abnormal heart rhythm, or death. The results suggest that, in patients who only experience short episodes of atrial fibrillation, the risks of bleeding associated with taking anticoagulants outweighs the risk of stroke. However, physicians should continue to monitor patients for progression to prolonged episodes of atrial fibrillation that may develop, Swiryn said. The RATE registry was funded by St. Jude Medical. Co-authors are Michael V. Orlov, M.D., Ph.D.; David G. Benditt, M.D. ; John P. DiMarco, M.D., Ph.D.; Donald M. Lloyd-Jones, M.D., Sc.M. ; Edward Karst, M.S. ; Fujian Qu, Sc.D. ; Mara T. Slawsky, M.D., Ph.D.; Melanie Turkel, M.S. and Albert L. Waldo, M.D., Ph.D.